The dilapidated buildings which dot downtown Beirut are constant reminders of what existed before, what was destroyed during, and what has occurred since the civil war which violently divided the city. A walk across Clemenceau, from Hamra towards downtown Beirut, is a perfect spring morning walk. A number of mansions and villas from the early to mid century, once considered summer houses away from the city, are now completely immersed in the urban fabric, both its past and its future. This article was featured on the Open Security’s website (www.opendemocracy.net) written by Camillo Boano and Dalia Chabarek on April the 18th, 2013. Beirut’s main train station has been completely wiped out, along with the train tracks linking Europe with Istanbul across Syria, Lebanon and Palestine, all the way to Egypt. New high-rise residential towers cover the empty plots of land, offering wealthy residents exclusive views of the Mediterranean, whilst blocking off the existing view for the rest of the neighbourhood. Many buildings remain remnants of war, abandoned by their original residents and occupied by squatters. The line of hotels and towers overlooking the area dominate the landscape; the extremely short-lived Holiday Inn and the unfinished trade centre Burj Al Murr which served as points of panoptic surveillance during the war, loom large at the top of the hill, while downhill sits the lavish and gracefully refurbished Phoenicia Intercontinental Hotel and the up-and-coming yet politically contested Saint Georges Hotel. Whilst walking anywhere in Beirut, one is forced to (re)imagine the past. The 15-year Civil War which engulfed Beirut broke the city into two sectarian pieces – the Muslim west and the Christian east – with the Damascus road, alternatively known as the city’s ‘green line’, operating as a fluid yet extraordinarily harsh physical divide between the two. The two separate areas of the city have developed over the past fifteen years to become largely self-sufficient; the services on either side of the divide have been duplicated such that osmosis of citizens across the border is unnecessary. Despite a formal and political 'stitching up' of east and west Beirut, after the war ended in 1990, the scar of the green line and its impact on the physical sectarian fabric of the city discretely lingers to this day. 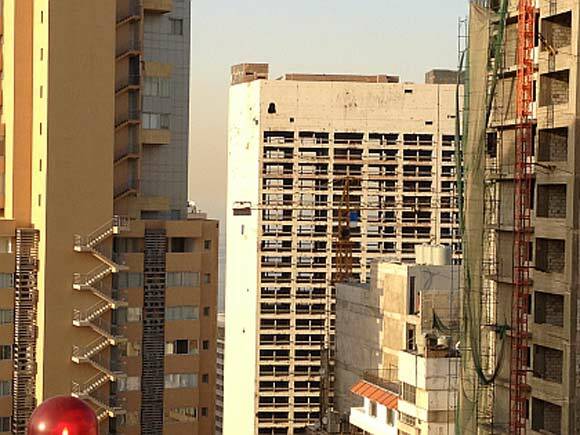 Beirut’s central district adjacent to the green line, suffered the greatest physical damage during the war, as such the area has undergone the greatest reconstruction in the post-war years. In doing so planners and architects have attempted to incorporate both the aesthetic of pre-war Beirut ‘charm’, and post-modern and neoliberal design into the development of the 21st century city. From 1975 to 1977 a brutal battle overwhelmed the Minet-el Hosn area which extended through Clemenceau, both in the heart of west Beirut. The battle was known as the ‘Battle of the Hotels’, in which a number of hotels and towers within Minet-el Hosn housed snipers of opposing militias engaged in militarised “dialogue”. While some of those hotels and towers have been refurbished after the war, others have remained in dormancy as bold reminders of the anguish of war. It has become a cliché in the city to note that Lebanon before the war was ‘the Switzerland of the Middle East’, hustling and bustling with casinos, cabarets, cafes, hotels, opera houses, cinemas and beaches. Those glory days of the city are known to the entire Beiruti community of all ages; from those who lived through them to those exposed to the stories and photos from older generations. The ‘glory days’ in many ways operate as millstone for contemporary Beirutis, a nostalgia for the past which frames the city’s hopes and wishes for the post-war era. Simultaneously, the dilapidated, war-torn buildings which dot the city are a constant reminder of the prolonged, exhausting, and destructive war which divided the people: “Militia power not only practiced ethnic, sectarian and political ‘cleansing’ of territories but also committed ‘memoricide’, the eradication of all memories of coexistence and common interests between Lebanese”. The Saint Georges Hotel draped with 'stop Solidere' banner. Solidere are the development company charged with developing the adjacent luxury beach resort. Dalia Chabarek. Saint Georges Hotel was once one of the most prestigious hotels in Beirut lying right on the seafront immediately adjacent to the contentious and highly exclusive Solidere development 'Zaitunay Bay'. The war-torn pink hotel has remained untouched since the war, but has been converted and functioned as a beach resort with swimming pools in recent times. In 2005, the Saint Georges (or more so the hotel building) was hit by the explosion which assassinated the former Prime Minister Rafik Hariri, which took place just a few meters away from the resort’s doorstep. The theatrical position and the contested nature of its tenure render evident a symbolic antagonism in the Saint Georges Hotel. The hotel and its bay still struggle to stand even after the vicious war, and have even entered their own war with Solidere, in it's community's resistance to the Zaitunay Bay development. 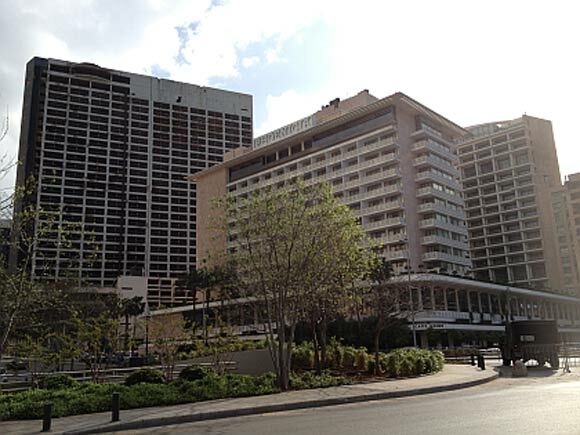 The reconstructed Phoenicia Intercontinental Hotel (right) adjacent to the war-torn Holiday Inn Hotel.Dalia Chabarek. The current most prestigious hotel in the country, the Phoenicia Intercontinental Hotel, is located directly opposite the Saint Georges Hotel. The hotel projects nostalgic images of the pre-war era. It was left abandoned for 25 years, but was restored in the late 1990s, reopening in March 2000. The hotel was damaged again in 2005 during the Hariri bombing, and consequently underwent another restoration. The glory days of the hotel have definitely undergone a renaissance. Rising from its own ashes and constantly reinventing its image the Phoenicia Intercontinental Hotel is a hard to die construct and an unfinished project of reinvention. Burj Al Murr overlooking the Holiday Inn Hotel (far left). Dalia Chabarek. The Burj Al Murr tower is a 40-storey unfinished tower that was intended to become the Trade Center of Lebanon. Its construction started in 1974, one year before the start of the war. The tower is a hard, concrete rectangular tube, and withstood the fighting that took place during the Battle of the Hotels. Dominated by Muslim militias throughout the two-year battle, the tower operated as a defense mechanism for the Christian militias who had seeped in to west Beirut. Its height and location on the top of the hill was ideal for a panoptic vision of the city. The tower still stands unfinished, hollow, full of scars, and protected by armored tanks. There have been many attempts to refurbish it and indeed to demolish it by various groups, but its height and solidity make it extremely difficult to topple. It currently serves as an artifact that stirs memories within the city-residents that have lived through the war, not to mention the generations that are still confronted with its presence. The Holiday Inn Hotel. Dalia Chabarek. Completed in 1974, just a year into its opening, The Holiday Inn declared an emergency evacuation of its staff and nearly 200 visitors on October 19th, 1975, when the Battle of the Hotels first commenced. The primary settlers of the hotel were Christian militias, for its height allowed alignment with their Muslim counterparts. The violent “dialogue” was thus concentrated in these two towers.The Holiday Inn is in a sense another monument of the war, the hotel, severely damaged with bullet holes and left in dormancy, is still standing surrounded by reconstructed, modern Beirut and protected by armored tanks. In War and Memory in Lebanon, Sune Haugbolle differentiates between lived and imagined memory: “whereas memory grounded in loved experience is a human condition, imagined memory is a distinctly modern phenomenon linked to the emergence of national publics and memory culture, which distils the cumulative experience of whole peoples in mass-mediated archetypical symbols, narratives and idioms”. The image of Lebanon before the war has become idealized, and has developed into a means to force amnesia of the war. On another note, “cultural elites and activists have argued that the traumatized Lebanese population needed to face the war to advance political change”. Walking anywhere in Beirut, one is confronted with the dynamic of what existed before the war, what was destroyed during the war and what has been developed since. Each of the four buildings we walked through holds particular significance to the social history of west-central Beirut. 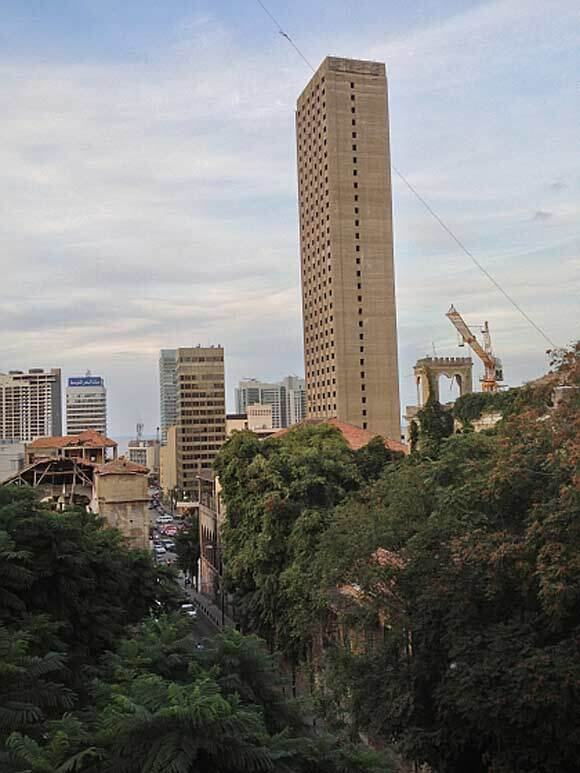 Burj Al Murr was the highest tower of its time, significantly taller than any other building in Beirut. Despite the recent erection of high rise towers on the seafront, the tower stands alone, and its structure imposes mystification. The fact that the building was only ever used in conflict, inscribes an aggressive and threatening presence to the tower. Similarly, memories of the Holiday Inn are inextricably tied to war. Its profound involvement in conflict and it’s physical reflection of the scars of war have developed into a mainstream descriptive image of the conflict. The Phoenicia Intercontinental Hotel is a relative success story, a landmark of early 70s Lebanon, which survived the 15 year hostile situation, only to successfully reemerge many years later. The Saint Georges Hotel could satisfy Haugbolle’s ‘cultural elites’; while bringing back a liberal, vogue and vintage beach culture to Beirut, the scarred hotel building nevertheless allows the visitors to reminisce on the war. The battle of the hotels in Beirut seems never ending and serves to preserve physical memories of conflict. And yet, each piece of architecture, every relic, does not simply signify an act of remembrance of war, but also stands out as separate from the preceding developments, as spaces and buildings not-yet-become subject to the aggressive market-led redevelopment of the contemporary city. The involuntary presence in a complex urban environment stands as both memorabilia of the war as well as resistance of regeneration; defying the oblivion of both the past and the future.